Arformoterol is a long-acting β2 adrenoreceptor agonist (LABA) indicated for the treatment of chronic obstructive pulmonary disease(COPD). It is sold by Sunovion, under the trade name Brovana, as a solution of arformoterol tartrate to be administered twice daily (morning and evening) by nebulization. It is the active (R,R)-(−)-enantiomer of formoterol and was approved by the United States Food and Drug Administration (FDA) on October 6, 2006 for the treatment of COPD. Arformoterol is an ADRENERGIC BETA-2 RECEPTOR AGONIST with a prolonged duration of action. It is used to manage ASTHMA and in the treatment of CHRONIC OBSTRUCTIVE PULMONARY DISEASE. Arformoterol is a beta2-Adrenergic Agonist. The mechanism of action of arformoterol is as an Adrenergic beta2-Agonist. Arformoterol is a long-acting beta-2 adrenergic agonist and isomer of formoterol with bronchodilator activity. 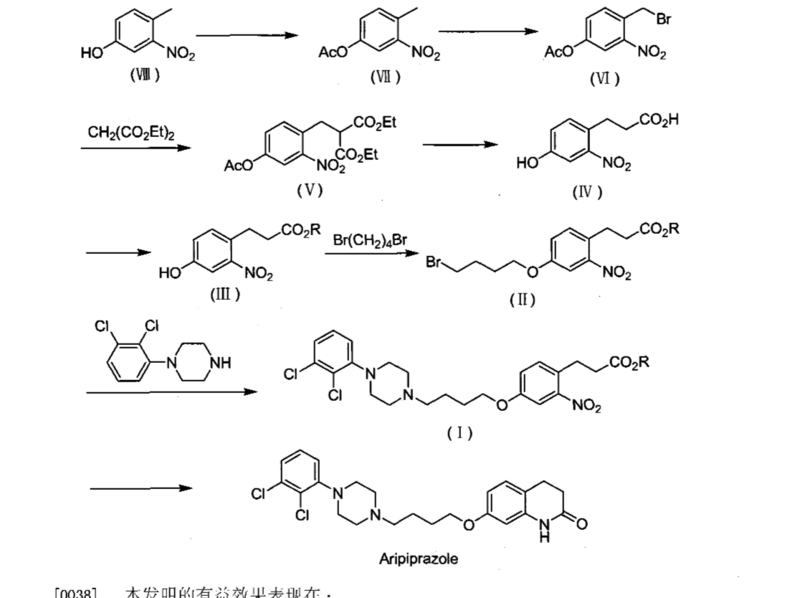 Arformoterol selectively binds to and activates beta-2 adrenergic receptors in bronchiolar smooth muscle, thereby causing stimulation of adenyl cyclase, the enzyme that catalyzes the conversion of adenosine triphosphate (ATP) to cyclic-3′,5′-adenosine monophosphate (cAMP). Increased intracellular cAMP levels cause relaxation of bronchial smooth muscle and lead to a reduced release of inflammatory mediators from mast cells. This may eventually lead to an improvement of airway function. Arformoterol Tartrate, can be used in the synthesis of Omeprazole (O635000), which is a proton pump inhibitor, that inhibits gasteric secretion, also used in the treatment of dyspepsia, peptic ulcer disease, etc. Itis also the impurity of Esomeprazole Magnesium (E668300), which is the S-form of Omeprazole, and is a gastric proton-pump inhibitor. Also, It can be used for the preparation of olodaterol, a novel inhaled β2-adrenoceptor agonist with a 24h bronchodilatory efficacy. A solution containing 3.9 g (26 mmol) of L-tartaric acid and 36 mL of methanol was added to a solution of 9 g (26 mmol) of arformoterol base and 144 mL methanol at 23.degree. C. Afterwards, the resulting mixture was seeded with form D and stirred at 23.degree. C. for 1 hour. It was then further cooled to 0-5.degree. C. for 1 hour and the product collected by filtration and dried under inlet air (atmospheric pressure) for 16 hours to provide 11.1 g (86% yield) (99.7% chemical purity, containing 0.14% of the degradation impurity (R)-1-(3-amino-4-hydroxyphenyl)-2-[[(1R)-2-(4-methoxyphenyl)-1-methylethy- l]amino]ethanol) of (R,R)-formoterol L-tartrate form D, as an off white powder. .sup.1H-NMR (200 MHz, d.sub.6-DMSO) .delta. : 1.03 (d, 3H); 2.50-2.67 (m, 5H); 3.72 (s, 3H); 3.99 (s, 2H); 4.65-4.85 (m, 1H); 6.82-7.15 (m, 5H); 8.02 (s, 1H); 8.28 (s, 1H); 9.60 (s, NH). No residual solvent was detected (.sup.1H-NMR). Chemical Research and Development, Sepracor Inc., 111 Locke Drive, Marlborough, Massachusetts 01752, U.S.A. The development and large-scale implementation of a novel technology utilizing polymorphic interconversion and crystalline intermediate formation of (R,R)-formoterol l-tartrate ((R,R)-FmTA, 1) as a tool for the removal of impurities from the final product and generation of the most thermodynamically stable crystal form is reported. The crude product was generated by precipitation of the free base as the l-tartrate salt in a unique polymorphic form, form B. Warming the resultant slurry effected the formation of a partially hydrated stable crystalline intermediate, form C, with a concomitant decrease in the impurity levels in the solid. Isolation and recrystallization of form C provided 1 in the thermodynamically most stable polymorph, form A. Afterwards, a small number of methods have been reported so far, regarding the synthesis of the (R,R) isomer, also referred as (R,R)-Formoterol and Arformoterol. Murase et al. [Chem. Pharm. Bull. 26(4) 1123-1129(1978)] reported the preparation of (R,R)-Formoterol from a racemic mixture of the (R,R) and (S,S) isomers by optical resolution using optically active tartaric acid. Trofast et al. 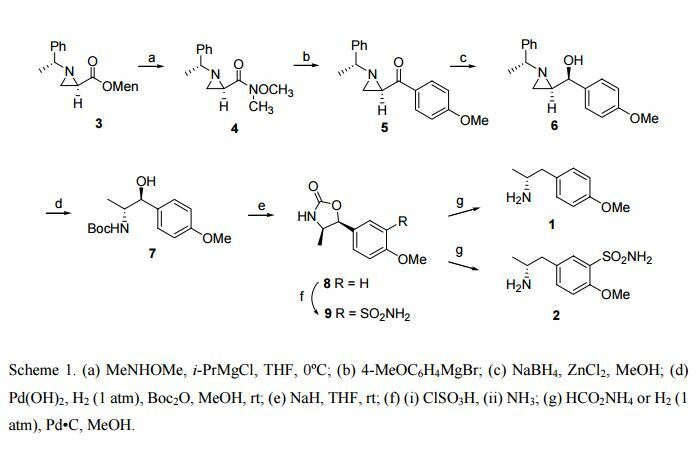 described a method in which 4-benzyloxy-3-nitrostyrene oxide was coupled with a optically pure (R,R)- or (S,S)-N-phenylethyl-N-(1-p-methoxyphenyl)-2-(propyl)amine to give a diastereomeric mixture of Formoterol precursors. These precursors were further separated by HPLC in order to obtain pure Formoterol isomers. Both synthetic processes undergo long synthetic procedures and low yields. 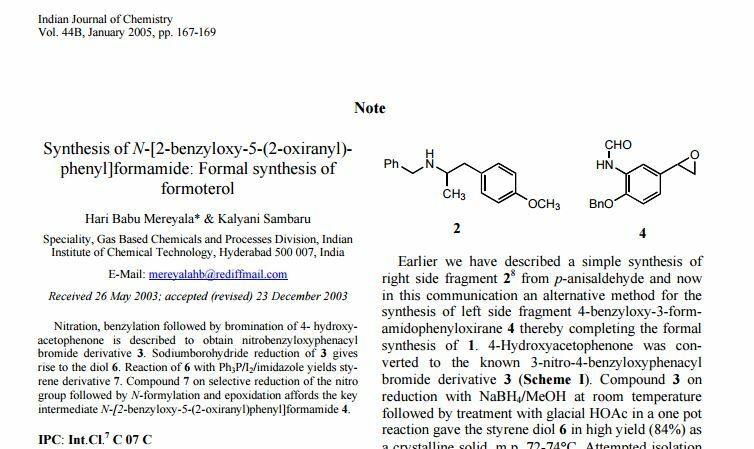 Patent publication EP0938467 describes a method in which Arformoterol is prepared via the reaction of the optically pure (R) N-benzyl-2-(4-methoxyphenyl)-1-(methylethylamine) with an optically pure (R)-4-benzyloxy-3-nitrostyrene oxide or (R)-4-benzyloxy-3-formamidostyrene oxide followed by formylation of the amino group. This method requires relatively severe reaction conditions, 24 h at a temperature of from 110 up to 130 °C as well as a further purification step using tartaric acid in order to eliminate diastereomer impurities formed during the process. Using chiral reductive agent with an enantiomeric excess of about 98% which requires further purification steps to obtain a product of desired optical purity. A solution of 90 g (0.25 mol) of (R)-1-(4-Benzyloxy-3-nitro-phenyl)-2-bromo-ethanol (compound I) in 320 mL of toluene and 50 mL of MeOH was added to a stirred suspension of 46 g (0.33 mol) of K2CO3 in 130 mL of toluene and 130 mL of MeOH. The mixture was stirred at 40°C for 20 h and washed with water (400 mL). The organic phase was concentrated under reduced pressure to a volume of 100 mL and stirred at 25 °C for 30 min. It was then further cooled to 0-5°C for 30 min. and the product collected by filtration and dried at 40 °C to provide 67.1 g (97% yield) (98% chemical purity, 100% e.e.) of compound II as an off-white solid. 1 H-NMR (200 MHz, CDCl3) δ: 2.80-2.90 (m, 2H); 3.11-3.20 (m, 2H), 3.80-3.90 (m, 1H); 5.23 (s, 2H); 7.11 (d, 2H); 7.41 (m, 5H), 7.76 (d, 2H). 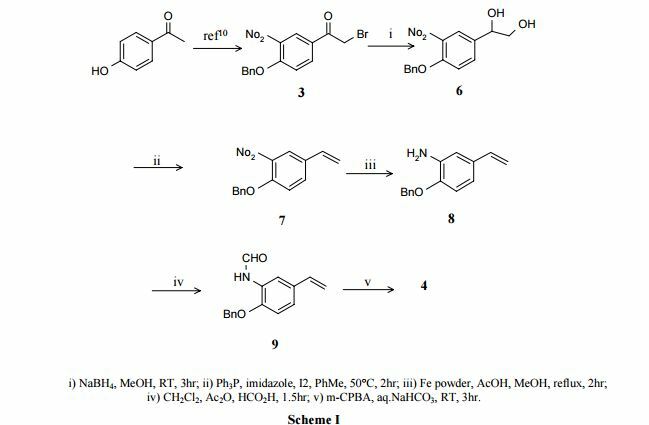 A solution of 13 g (78.6 mmol) of 1-(4-Methoxy-phenyl)-propan-2-one and 8.3 g (78.6 mmol) of (R)-1-Phenylethylamine in 60 mL MeOH was hydrogenated in the presence of 1.7 g of Pt/C 5% at 10 atm. and 30 °C for 20 h. The mixture was filtered though a pad of diatomaceous earth and concentrated under reduced pressure to give compound III as an oil. The obtained oil was dissolved in 175 mL of acetone, followed by addition of 6.7 mL (80.9 mmol) of a 12M HCl solution. The mixture was stirred at 23 °C for 30 min and at 0-5 °C for 30 min. The product collected by filtration and dried at 40 °C to provide 13.8 g of the hydrochloride derivate as a white solid. The obtained solid was stirred in 100 mL of acetone at 23 °C for 1h and at 0-5 °C for 30 min, collected by filtration and dried at 40 °C to provide 13.2 g of the hydrochloride derivate as a white solid. This compound was dissolved in 100 mL of water and 100 mL of toluene followed by addition of 54 mL (54 mmol) of 1N NaOH solution. 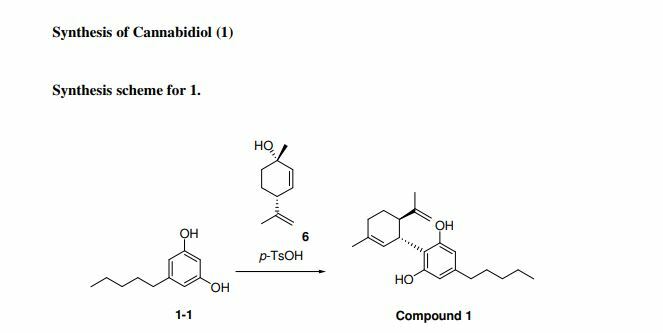 The organic phase was concentrated to give 11.7 g (55% yield) (99% chemical purity and 100% e.e) of compound III as an oil.1H-NMR (200 MHz, CDCl3) δ: 0.88 (d, 3H); 1.31 (d, 3H), 2.40-2.50 (m, 1H); 2.60-2.80 (m, 2H); 3.74 (s, 3H); 3.90-4.10 (m, 1H); 6.77- 6.98 (m, 4H), 7.31 (s, 5H). A 1-liter flask was charged with 50g (0.18 mol) of II and 50g (0.18 mol) of III and stirred under nitrogen atmosphere at 140 °C for 20 h. To the hot mixture was added 200 mL of toluene to obtain a solution, which was washed with 200 mL of 1N HCl and 200 mL of water. The organic phase was concentrated under reduced pressure to give 99 g (99% yield) (88% chemical purity) of compound IV as an oil. Enantiomeric purity 100%. 1H-NMR (200 MHz, CDCl3) δ: 0.98 (d, 3H); 1.41 (d, 3H), 2.60-2.90 (m, 4H); 3.20-3.30 (m, 1H); 3.74 (s, 3H); 4.10-4.20 (m, 1H); 4.30-4.40 (m, 1H), 5.19 (s, 2H); 6.69-7.42 (m, 16H); 7.77 (s, 1H). A solution of 99 g (0.18 mol) of IV in 270 mL IPA and 270 mL toluene was hydrogenated in the presence of 10 g of Ni-Raney at 18 atm and 40 °C for 20 h. The mixture was filtered though a pad of diatomaceous earth and the filtrate was concentrated under reduced pressure to give 87 g (92% yield) (83% chemical purity, 100 % e.e.) of compound V as an oil. 1H-NMR (200 MHz, CDCl3) δ: 0.97 (d, 3H); 1.44 (d, 3H), 2.60-2.90 (m, 4H); 3.20-3.30 (m, 1H); 3.74 (s, 3H); 4.10-4.20 (m, 1H); 4.30-4.40 (m, 1H), 5.07 (s, 2H); 6.67-6.84 (m, 7H); 7.25-7.42 (m, 10H). 24 mL (0.63 mol) of formic acid was added to 27 mL (0.28 mol) of acetic anhydride and stirred at 50 °C for 2 h under nitrogen atmosphere. The resulting mixture was diluted with 100 mL of CH2Cl2 and cooled to 0 °C. A solution of 78 g (0.15 mol) of V in 300 mL de CH2Cl2 was slowly added and stirred for 1h at 0 °C. Then, 150 mL of 10% K2CO3 aqueous solution were added and stirred at 0 °C for 15 min. The organic phase was washed twice with 400 mL of 10% K2CO3 aqueous solution and concentrated under reduced pressure to give 80 g (97% yield, 100% e.e.) (75% chemical purity) of compound VI as an oil. 1H-NMR (200 MHz, CDCl3) δ: 0.98 (d, 3H); 1.42 (d, 3H), 2.60-2.90 (m, 4H); 3.20-3.30 (m, 1H); 3.75 (s, 3H); 4.10-4.20 (m, 1H); 4.30-4.40 (m, 1H), 5.09 (s, 2H); 6.67-7.41 (m, 17H); 8.4 (d, 1H). 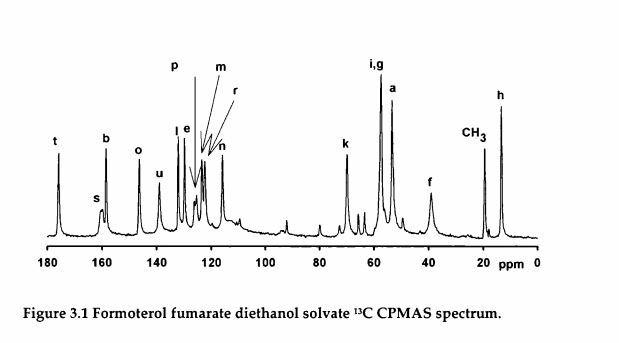 A solution of 8.5 g (16 mmol) of VI, previous purified by column chromatography on silica gel (AcOEt/heptane, 2:3), in 60 mL ethanol was hydrogenated in the presence of 0.14 g of Pd/C 5% at 10 atm. and 40 °C for 20 h. The mixture was filtered though a pad of diatomaceous earth and concentrated under reduced pressure to give 5 g (93% yield) (91% chemical purity, 100% e.e.) of compound VII as foam. m. p.= 58-60 °C. 1H-NMR (200 MHz, d6-DMSO) δ: 0.98 (d, 3H); 2.42-2.65 (m, 5H); 3.20-3.40 (m, 1H); 3.71 (s, 3H); 4.43-4.45 (m, 1H); 6.77-7.05 (m, 5H); 8.02 (s, 1H), 8.26 (s, 1H). A solution of 46 g (0.08 mol) of VI, crude product, was dissolved in 460 mL ethanol and hydrogenated in the presence of 0.74 g of Pd/C 5% at 10 atm. and 40 ° C for 28 h. The mixture was filtered though a pad of diatomaceous earth and the filtrate was concentrated under reduced pressure to give 24 g (83% yield) (77% chemical purity, 100% e.e.) of compound VII as a foam. m. p. = 58-60 °C. 1H-NMR (200 MHz, d6-DMSO) δ: 0.98 (d, 3H); 2.42-2.65 (m, 5H); 3.20-3.40 (m, 1H); 3.71 (s, 3H); 4.43-4.45 (m, 1H); 6.77-7.05 (m, 5H); 8.02 (s, 1H), 8.26 (s, 1H). (R) -2- (4- benzyloxy-3-nitrophenyl) oxirane (I) (9. 86g, 36mmol) and (R) -I- (4- methoxy- phenyl) -N – [(R) -I- phenyl-ethyl] -2-amino-propane (II) (10. 8g, 40mmol) cast in the reaction flask, the reaction 20 hours at 140 ° C, the chiral Intermediate (III) (17. 3g, yield 88%). 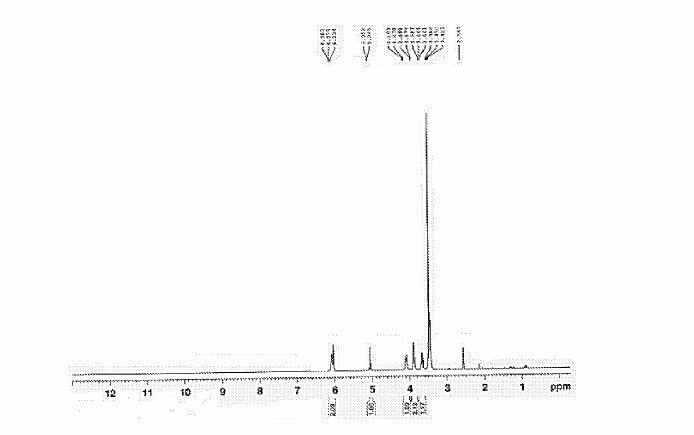 HPLC: de values of> 90%; MS (ESI) m / z: 541 3 (M ++ 1); 1H-NMR (CDCl3):.. Δ 0. 96 (d, 3H), 1 49 (d, 3H ), 2 · 15 (q, 1Η), 2 · 67 (dq, 2H), 2. 99 (dq, 2H), 3. 74 (s, 3H), 4. 09 (d, 1H), 4. 56 (q, 1H), 5. 24 (s, 2H), 6. 77 (dd, 4H), 7. 10 (d, 1H), 7. 25-7. 5 (m, 11H), 7. 84 ( s, 1H). (R) -2- (4- benzyloxy-3-nitrophenyl) oxirane (I) (9. 86g, 36mmol) and (R) -I- (4- methoxybenzene yl) -N – [(R) -I- phenyl-ethyl] -2-amino-propane (II) (10. 8g, 40mmol) and toluene 100ml, 110 ° C0-flow reactor 36 hours, the solvent was distilled off succeeded intermediates (III) (16. 8g, yield 85%). (R) -2- (4- benzyloxy-3-nitrophenyl) oxirane (I) (9. 86g, 36mmol) and (R) -I- (4- methoxybenzene After [(R) -I- phenyl-ethyl] -2-amino-propane (II) (10. 8g, 40mmol) and dichloromethane 100ml, 30 ° C for 48 hours, and the solvent was distilled off – yl) -N succeeded intermediates (III) (15. Sg, yield 80%). (R) -2- (4- benzyloxy-3-nitrophenyl) oxirane (I) (9. 86g, 36mmol) and (R) -I- (4- methoxybenzene yl) -N – [(R) -I- phenyl-ethyl] -2-amino-propane (II) (8. 75g, 32mmol) cast in the reaction flask, the reaction 20 hours at 140 ° C, the chiral intermediate form (III) (16. 3g, 83% yield). (R) -2- (4- benzyloxy-3-nitrophenyl) oxirane (I) (9. 86g, 36mmol) and (R) -I- (4- methoxybenzene yl) -N – [(R) -I- phenyl-ethyl] -2-amino-propane (II) (14. 6g, 54mmol) cast in the reaction flask, the reaction 20 hours at 140 ° C, the chiral intermediate form (III) (17. 5g, 89% yield). 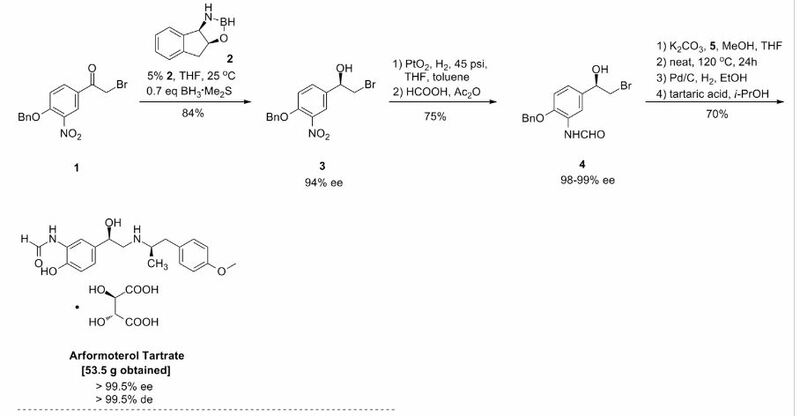 The enantioselective reduction of phenacyl bromide (I) with BH3.S(CH3)2 in THF catalyzed by the chiral borolidine (II) (obtained by reaction of (1R,2S)-1-amino-2-indanol (III) with BH3.S(CH3)2 in THF) gives the (R)-2-bromo-1-(4-benzyloxy-3-nitrophenyl)ethanol (IV), which is reduced with H2 over PtO2 in THF/toluene yielding the corresponding amino derivative (V). The reaction of (V) with formic acid and Ac2O affords the formamide (VI), which is condensed with the chiral (R)-N-benzyl-N-[2-(4-methoxyphenyl)-1-methylethyl]amine (VII) in THF/methanol providing the protected target compound (VIII). Finally, this compound is debenzylated by hydrogenation with H2 over Pd/C in ethanol. 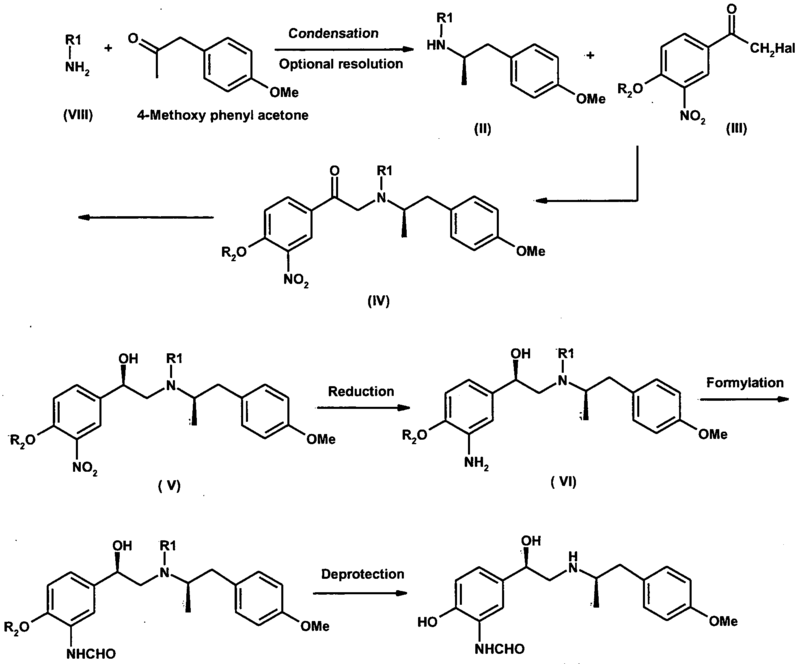 The intermediate the chiral (R)-N-benzyl-N-[2-(4-methoxyphenyl)-1-methylethyl]amine (VII) has been obtained by reductocondensation of 1-(4-methoxyphenyl)-2-propanone (IX) and benzylamine by hydrogenation with H2 over Pd/C in methanol yielding racemic N-benzyl-N-[2-(4-methoxyphenyl)-1-methylethyl]amine (X), which is submitted to optical resolution with (S)-mandelic acid to obtain the desired (R)-enantiomer (VII). (R,R)-Formoterol (1) is a long-acting, very potent β2-agonist, which is used as a bronchodilator in the therapy of asthma and chronic bronchitis. 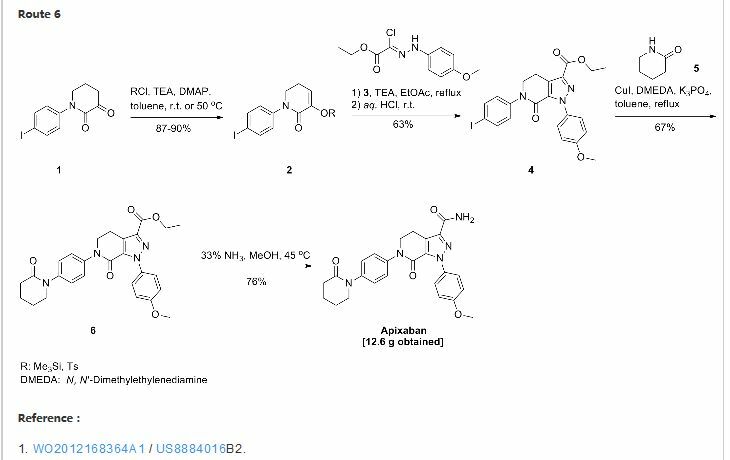 Highly convergent synthesis of enantio- and diastereomerically pure (R,R)-formoterol fumarate is achieved by a chromatography-free process with an overall yield of 44%. 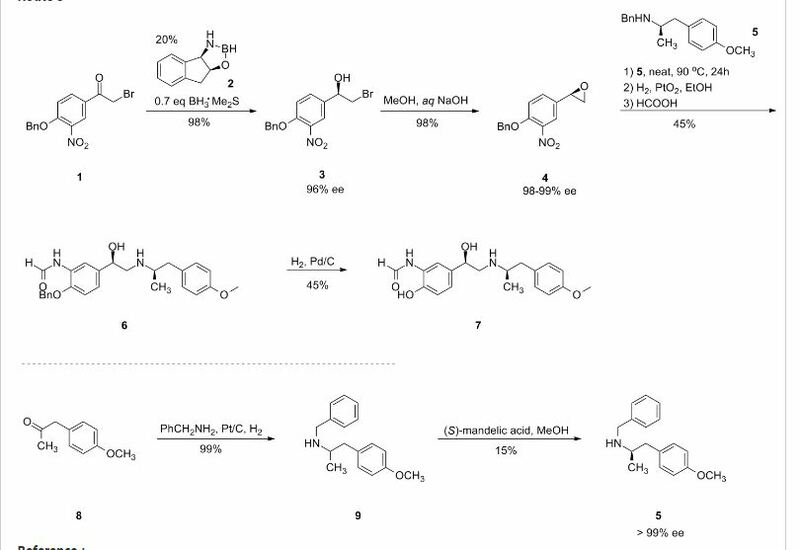 Asymmetric catalytic reduction of bromoketone 4 using as catalyst oxazaborolidine derived from (1R, 2S)-1-amino-2-indanol and resolution of chiral amine 3 are the origins of chirality in this process. Further enrichment of enantio- and diastereomeric purity is accomplished by crystallizations of the isolated intermediates throughout the process to give (R,R)-formoterol (1) as the pure stereoisomer (ee, de >99.5%). The intermediate N-benzyl-N-[1(R)-methyl-2-(4-methoxyphenyl)ethyl]amine (IV) has been obtained as follows: The reductocondensation of 1-(4-methoxyphenyl)-2-propanone (I) with benzylamine (II) by H2 over Pd/C gives the N-benzyl-N-[1-methyl-2-(4-methoxyphenyl)ethyl]amine (III) as a racemic mixture, which is submitted to optical resolution with L-mandelic acid in methanol to obtain the desired (R)-enantiomer (IV). 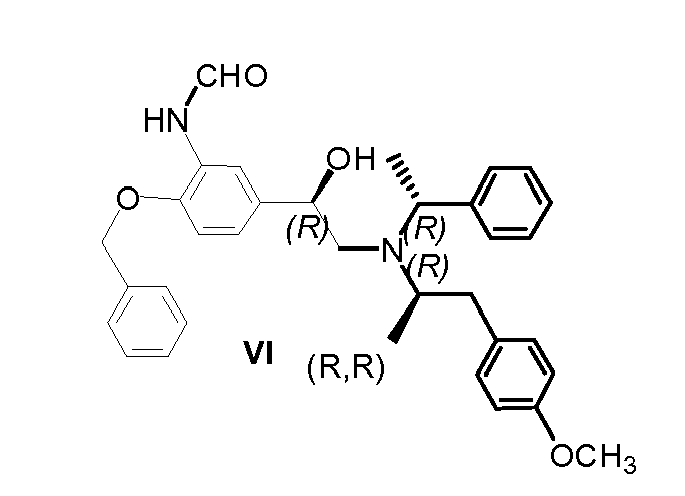 The reaction of cis-(1R,2S)-1-aminoindan-2-ol (V) with trimethylboroxine in toluene gives the (1R,2S)-oxazaborolidine (VI), which is used as chiral catalyst in the enantioselective reduction of 4-benzyloxy-3-nitrophenacyl bromide (VII) by means of BH3/THF, yielding the chiral bromoethanol derivative (VIII). The reaction of (VIII) with NaOH in aqueous methanol affords the epoxide (IX), which is condensed with the intermediate amine (IV) by heating the mixture at 90 C to provide the adduct (X). The reduction of the nitro group of (X) with H2 over PtO2 gives the corresponding amino derivative (XI), which is acylated with formic acid to afford the formamide compound (XII). Finally, this compound is debenzylated by hydrogenation with H2 over Pd/C in ethanol, providing the target compound. 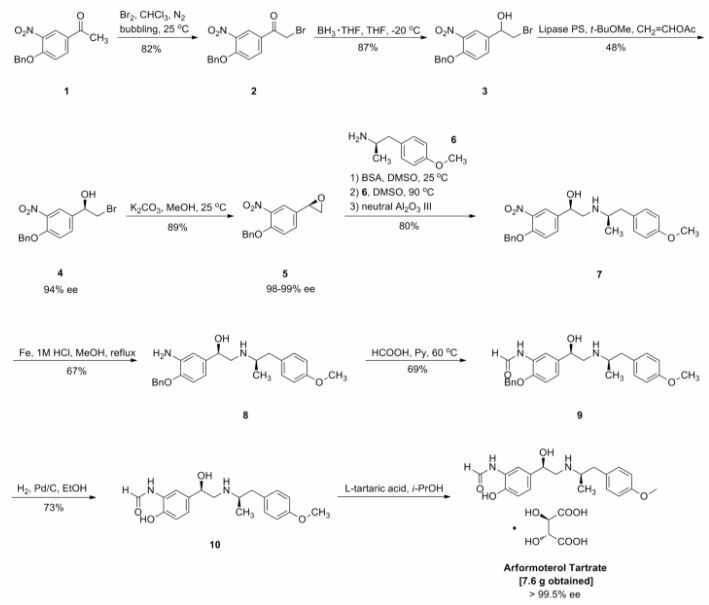 The synthesis of the chiral borolidine catalyst (II) starting from indoline (I), as well as the enantioselective reduction of 4′-(benzyloxy)-3′-nitrophenacyl bromide (III), catalyzed by borolidine (II), and using various borane complexes (borane/dimethylsulfide, borane/THF and borane/diethylaniline), has been studied in order to solve the problems presented in large-scale synthesis. The conclusions of the study are that the complex borane/diethylaniline (DEANB) is the most suitable reagent for large-scale reduction of phenacyl bromide (III) since the chemical hazards and inconsistent reagent quality of the borane/THF and borane/dimethylsulfide complexes disqualified their use in large-scale processes. The best reaction conditions of the reduction with this complex are presented. Formoterol is a long-acting β2-adrenoceptor agonist and has a long duration of action of up to 12 hours. Chemically it is termed as Λ/-[2-hydroxy-5-[1-hydroxy-2-[[2-(4- methoxyphenyl)propan-2-yl]amino]ethyl]phenyl]-formamide. 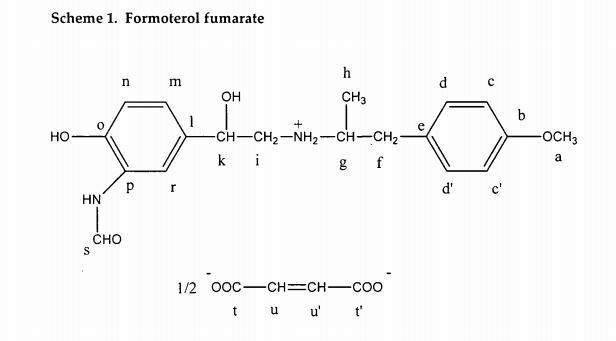 The structure of formoterol is as shown below. The asterisks indicate that formoterol has two chiral centers in the molecule, each of which can exist in two possible configurations. This gives rise to four diastereomers which have the following configurations: (R,R), (S1S), (S1R) and (R1S). 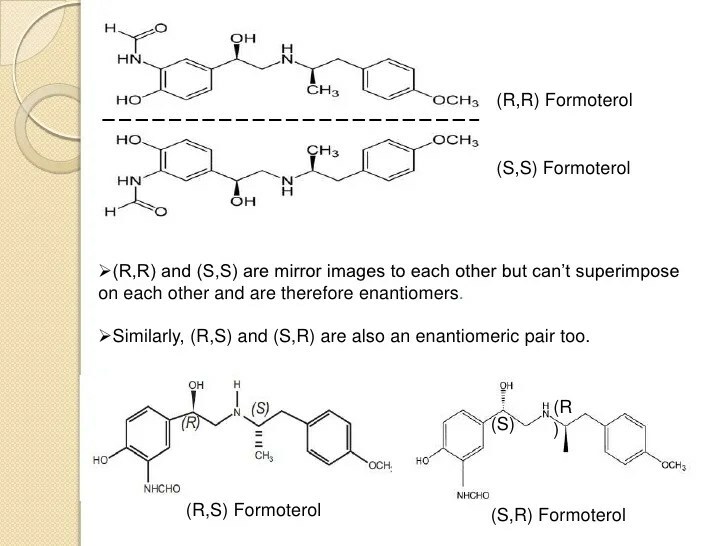 (R1R) and (S1S) are mirror images of each other and are therefore enantiomers. Similarly (S1R) and (R1S) form other enatiomeric pair. The commercially-available formoterol is a 50:50 mixture of the (R1R)- and (S1S)- enantiomers. (R,R)-formoterol is an extremely potent full agonist at the β2-adrenoceptor and is responsible for bronchodilation and has anti-inflammatory properties. On the other hand (S,S)-enantiomer, has no bronchodilatory activity and is proinflammatory. Murase et al. 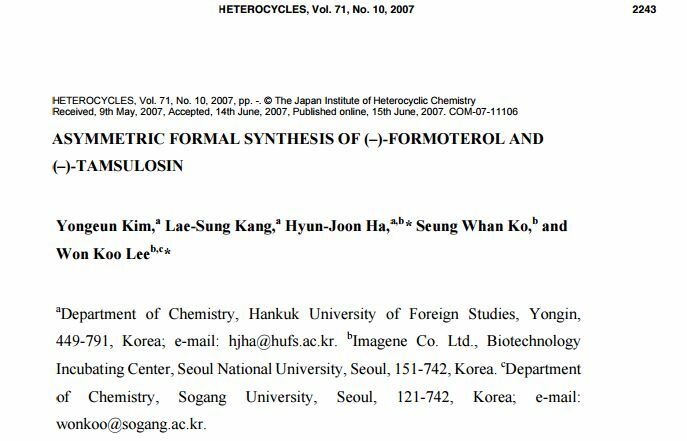 [Chem.Pharm.Bull., .26(4)1123-1129(1978)] synthesized all four isomers of formoterol and examined for β-stimulant activity. In the process, racemic formoterol was subjected to optical resolution with tartaric acid. In another attempt by Trofast et al. 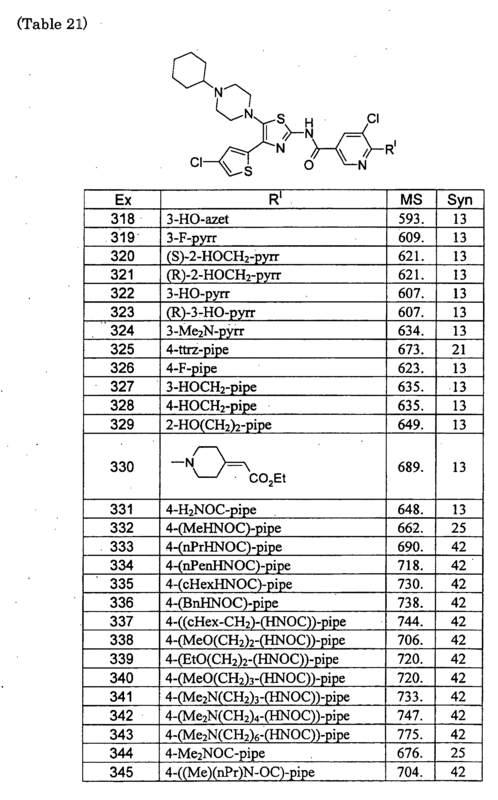 [Chirality, 3:443-450(1991 )], racemic 4-benzyloxy-3- nitrostryrene oxide was coupled with optically pure N-[(R)-1-phenylethyl]-2-(4- methoxyphenyl)-(R)1-methylethylamine to give diastereomeric mixtures of intermediates, which were separated by column chromatography and converted to the optically pure formoterol. 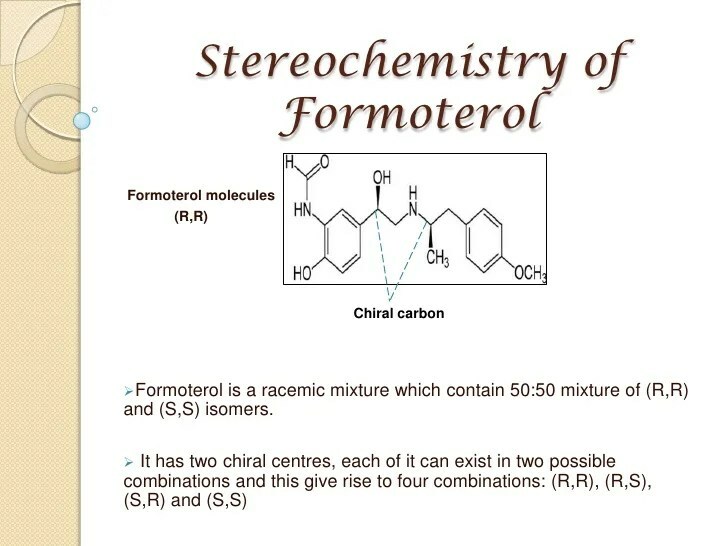 In yet another attempt, racemic formoterol was subjected to separation by using a chiral compound [International publication WO 1995/018094]. 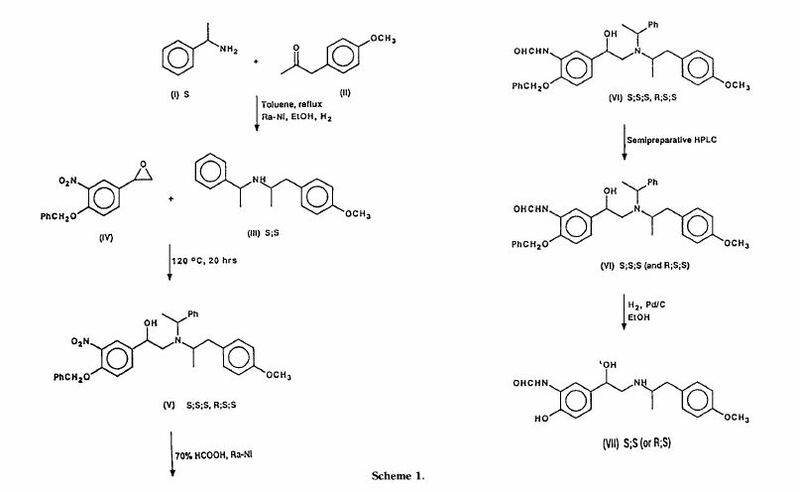 WO 98/21175 discloses a process for preparing optically pure formoterol using optically pure intermediates (R)-N-benzyl-2-(4-methoxyphenyl)-1-methylethyl amine and (R)-4- benzyloxy-3-formamidostyrene oxide. 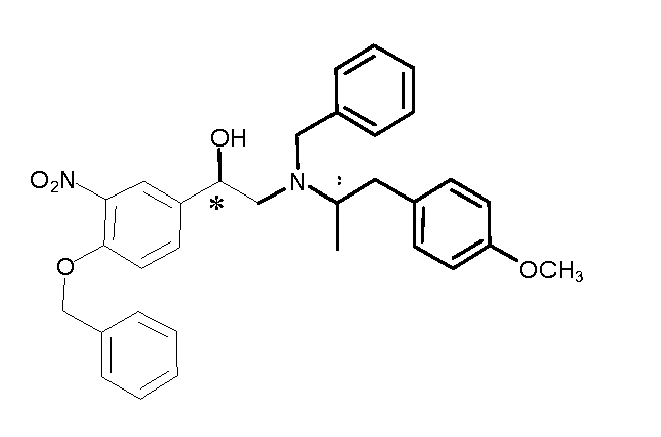 Preparation of optically pure formoterol is also disclosed in IE 000138 and GB2380996. 4-benzyloxy-3-formylamino-α-[N-benzyl-N-(1-methyl-2-p- methoxyphenylethyl)aminomethyl]benzyl alcohol (120gms, 0.23M), 10% Pd/C (12 gms) and denatured spirit (0.6 lit) were introduced in an autoclave. The reaction mass was hydrogenated by applying 4 kg hydrogen pressure at 25-300C for 3 hrs. The catalyst was removed by filtration and the, clear filtrate concentrated under reduced pressure below 400C to yield the title compound. (63 gms, 80%). The tartrate salt was dissolved in hot 50% IPA-water (0.3 lit), cooled as before and filtered to provide arformoterol tartrate. (30 gms, 50 % w/w). having enantiomeric purity greater than 99%. 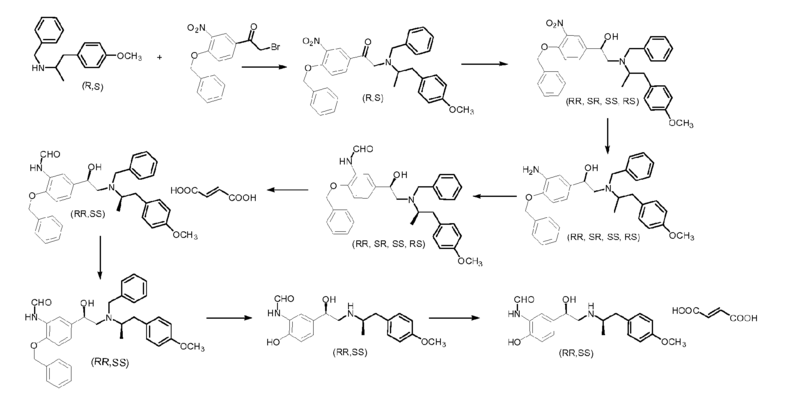 In the synthesis of the β2-adrenoceptor agonist (R,R)-formterol, a key step in the synthesis was the development of a highly chemoselective reduction of (1R)-2-bromo-1-[3-nitro-4-(phenylmethoxy)phenyl]ethan-1-ol to give (1R)-1-[3-amino-4-(phenylmethoxy)phenyl]-2-bromoethan-1-ol. The aniline product was isolated as the corresponding formamide. The reaction required reduction of the nitro moiety in the presence of a phenyl benzyl ether, a secondary benzylic hydroxyl group, and a primary bromide, and with no racemization at the stereogenic carbinol carbon atom. The development of a synthetic methodology using heterogeneous catalytic hydrogenation to perform the required reduction was successful when a sulfur-based poison was added. The chemistry of sulfur-based poisons to temper the reacitivty of catalyst was studied in depth. The data show that the type of hydrogenation catalyst, the oxidation state of the poison, and the substituents on the sulfur atom had a dramatic effect on the chemoselectivity of the reaction. Dimethyl sulfide was the poison of choice, possessing all of the required characteristics for providing a highly chemoselective and high yielding reaction. The practicality and robustness of the process was demonstrated by preparing the final formamide product with high chemoselectivity, chemical yield, and product purity on a multi-kilogram scale. formoterol (R,R)-1 as amorphous solid. Rf: 0.27 (SiO2, AcOEt:MeOH, 1:1).20D=-41.5 (CHCl3, c 0.53). IR, : 3383, 2967, 2923, 1674, 1668, 1610, 1514, 1442, 1247, 1033,815 cm^1. 1H NMR (300 MHz, CDCl3), : 8.11 (b, 1H), 7.46 (b, 1H), 6.99 (d, J=8.4 Hz, 2H), 6.9±6.7 (c, 4H), 4.46 (m, 1H), 4.34 (b, 3H interchangeable), 3.74 (s, 3H), 2.90±2.45 (c, 5H), 1.02 (d,J=5.7 Hz, 3H) ppm. 13C NMR (75 MHz, CDCl3), : 160.2, 158.3, 147.7, 133.4, 130.6, 130.2 (2C),125.7, 123.7, 119.5, 117.8, 114.0 (2C), 71.3, 55.3, 54.7, 53.6, 42.0, 19.4 ppm. CI (positive, LC-MS)(m/z, %) 435 (M+1, 100). The tartrate salt was prepared by dissolving 13.8 mg (0.04 mmol) of(R,R)-1 and 6.0 mg (0.04 mmol) of (l)-(+)-tartaric acid in 150 mL of 85% aqueous isopropanol. reported value 34). 34=Hett, R.; Senanayake, C. H.; Wald, S. A. Tetrahedron Lett. 1998, 39, 1705. Chemical Research and Development, Sepracor Incorporated, 111 Locke Drive, Marlborough, Massachusetts 01752, U.S.A. The development of a process for the use of N,N-diethylaniline−borane (DEANB) as a borane source for the enantioselective preparation of a key intermediate in the synthesis of (R,R)-formoterol l-tartrate, bromohydrin 2, from ketone 3 on kilogram scale is described. DEANB was found to be a more practical, safer, and higher-quality reagent when compared to other more conventional borane sources: borane−THF and borane−DMS. Arformoterol: (R,R)-eformoterol, (R,R)-formoterol, arformoterol tartrate, eformoterol-sepracor, formoterol-sepracor, R,R-eformoterol, R,R-formoterol. Sepracor in the US is developing arformoterol [R,R-formoterol], a single isomer form of the beta(2)-adrenoceptor agonist formoterol [eformoterol]. This isomer contains two chiral centres and is being developed as an inhaled preparation for the treatment of respiratory disorders. Sepracor believes that arformoterol has the potential to be a once-daily therapy with a rapid onset of action and a duration of effect exceeding 12 hours. In 1995, Sepracor acquired New England Pharmaceuticals, a manufacturer of metered-dose and dry powder inhalers, for the purpose of preparing formulations of levosalbutamol and arformoterol. Phase II dose-ranging clinical studies of arformoterol as a longer-acting, complementary bronchodilator were completed successfully in the fourth quarter of 2000. Phase III trials of arformoterol began in September 2001. The indications for the drug appeared to be asthma and chronic obstructive pulmonary disease (COPD). However, an update of the pharmaceutical product information on the Sepracor website in September 2003 listed COPD maintenance therapy as the only indication for arformoterol. In October 2002, Sepracor stated that two pivotal phase III studies were ongoing in 1600 patients. Sepracor estimates that its NDA submission for arformoterol, which is projected for the first half of 2004, will include approximately 3000 adult subjects. Sepracor stated in July 2003 that it had completed more than 100 preclinical studies and initiated or completed 15 clinical studies for arformoterol inhalation solution for the treatment of bronchospasm in patients with COPD. In addition, Sepracor stated that the two pivotal phase III studies in 1600 patients were still progressing. In 1995, European patents were granted to Sepracor for the use of arformoterol in the treatment of asthma, and the US patent application was pending. 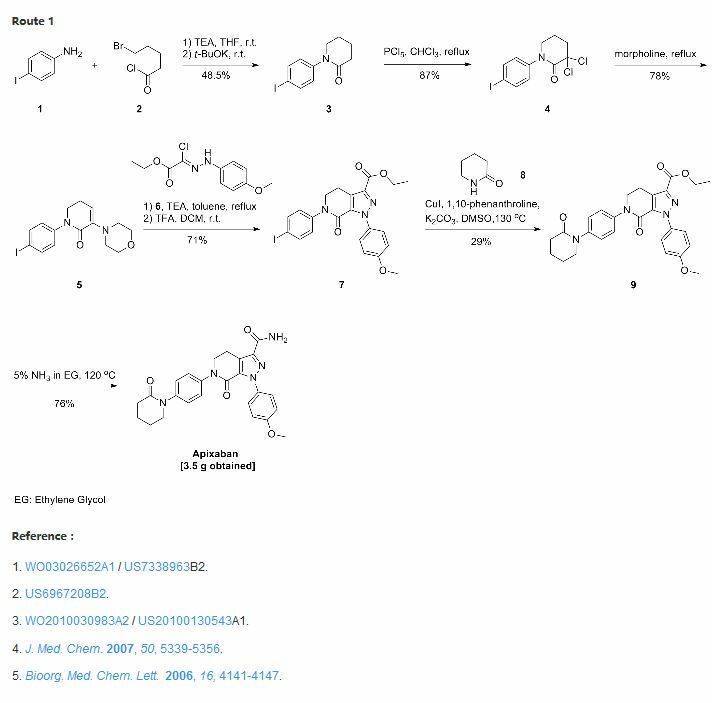 (R)-1-(4-Methoxyphenyl)propan-2-amine 2a, an optical active intermediate for (R,R)-formoterol, was synthesized from d-alanine in 65% overall yield by using a simple route, which contained protecting amino group, cyclization, coupling with Grignard reagent, reduction and deprotection. “Brovana Prescribing information, Dosage and Administration section”. Archived from the original on 13 February 2008. Retrieved2008-03-14. Literature References: Selective b2-adrenergic receptor agonist. Mixture of R,R (-) and S,S (+) enantiomers. 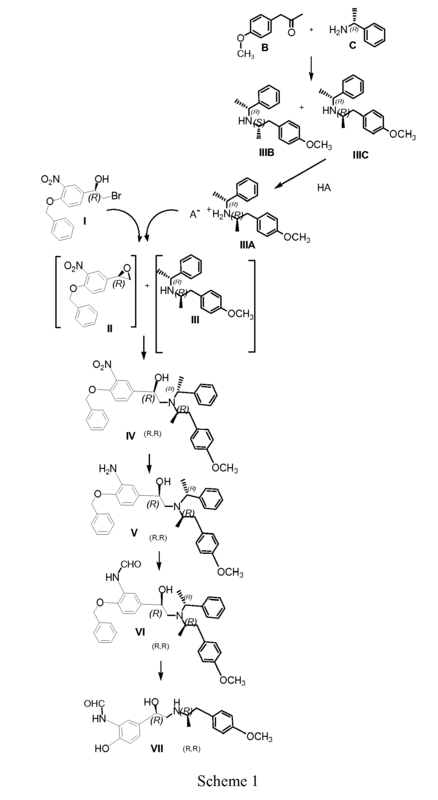 Prepn: M. Murakamiet al., DE 2305092; eidem, US 3994974 (1973, 1976 both to Yamanouchi); K. Murase et al., Chem. Pharm. Bull. 25, 1368 (1977). Absolute configuration and activity of isomers: eidem, ibid. 26, 1123 (1978). Toxicity studies: T. Yoshida et al., Pharmacometrics26, 811 (1983). HPLC determn in plasma: J. Campestrini et al., J. Chromatogr. B 704, 221 (1997). Review of pharmacology: G. P. Anderson, Life Sci. 52, 2145-2160 (1993); and clinical efficacy: R. A. Bartow, R. N. Brogden, Drugs 55, 303-322 (1998). Properties: Crystals from 95% isopropyl alcohol, mp 138-140°. pKa1 7.9; pKa2 9.2. Log P (octanol/water): 0.4 (pH 7.4). Freely sol in glacial acetic acid; sol in methanol; sparingly sol in ethanol, isopropanol; slightly sol in water. Practically insol in acetone, ethyl acetate, diethyl ether. LD50 in male, female, rats, mice (mg/kg): 3130, 5580, 6700, 8310 orally; 98, 100, 72, 71 i.v. ; 1000, 1100, 640, 670 s.c.; 170, 210, 240, 210 i.p. (Yoshida). 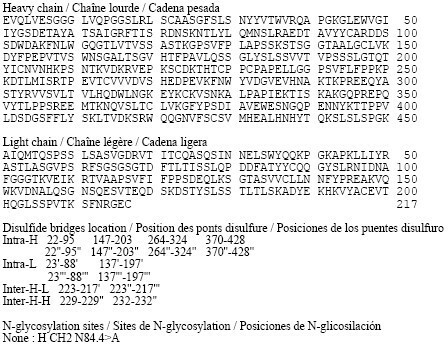 Literature References: Prepn: Y. Gao et al., WO 9821175; eidem, US 6040344 (1998, 2000 both to Sepracor). Pharmacology: D. A. Handley et al., Pulm. Pharmacol. Ther. 15, 135 (2002). Properties: Off-white powder, mp 184°. By DR ANTHONY MELVIN CRASTO Ph.D in GENERICS on August 3, 2016 .